Money advice–sometimes we can’t seem to get enough of it. Growing up we each had such a different experience on what we learned (or didn’t learn about money). Money touches a different aspect of our lives and in all different ways! 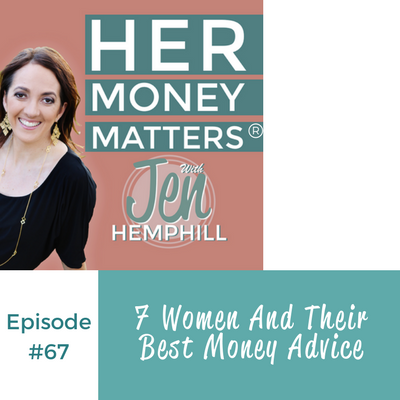 Tune in as 7 women (all listeners like you) share their best piece of money advice they wished they received growing up! Download your Jumpstart Your Money Mini-Guide Here. Join us in our free community on Facebook! Now it is your turn, I’d love to hear from you! What is the best piece of advice you wish you got when you were growing up? Please be sure to share in the comments below or head on over to our community and share there! [00:00:26.3] JH: Hello, hello there. Thanks for being here with me. This one is going to be a fun episode as I got you involved in this one so I am excited about this and I know that we can all agree that we each had a different experience growing up on what we learned or maybe what we didn’t learn about money. And it doesn’t stop there because as you will hear today, you will notice that money touches a very specific aspect, a very specific piece in our life and that is why personal finance is so unique and so different for every person. With money, there is a lot of emotion attached that affects how we treat it, how we spend it, how we manage it, what we think about it, right? So that’s why I wanted to include you in this episode as I know you’re thoughts, your experience will make a difference in someone’s life. Like Deepak Chopra says, “Each of us is a unique strand in the intricate web of life and here to make a contribution.” So yes, you definitely have a contribution to make. Now before we get in today’s episode, I wanted to remind you that if you are stuck with your money and don’t know where to start, I recommend you getting clear as to where your money is going and my Jumpstart Your Money Mini-Guide will help you do this in a none overwhelming way. It’s free and you can get it at jenhemphill.com/miniguide. Now let’s hear what you each had to say as the best money advice you wish you knew growing up. [00:02:30.8] R: A few years ago, I had a friend tell me how her parents handled money when they were young. Even though they struggled, often they had little to eat and were really stretching to get by but they never lived in this stress nor let it rule their lives. When they had eggs for dinner because that’s all they had, they made a breakfast party out of it. It helped them really coolly moved throughout life without freaking out about money at every turn. Whereas in my household, we, everyone fretted about money. I now have a very nervous relationship about money. I wish I could tell my younger self to keep cool, keep calm and collected about money. It’s going to be okay. Because freaking out doesn’t pay the bills” and that is so very true Rachel. No emotions will definitely, it won’t help you move forward with your money. So I love, love that piece of advice. Now let’s hear what Mabel has to say in her voice recording. [00:03:36.8] M: Hi everyone, my name is Mabel and I am the founder and CEO of Girls On The Money. The mission of Girls On The Money is to teach women how to understand the stock market and how to benefit from it. In terms of Jen’s question, what money advice I wish I had received growing up, I would say is understanding the power of compound interest and the power of time when it comes to building wealth. I think if somebody had sat me down when I was 12 or 15 years old and will have told me, “Hey, if you start saving and investing now you could probably retire in 20 years. Maybe you’ll be retired by the time you’re 30 years old.” So I think that’s how my life will be different. Had I got into that advice as a teenager, I will be probably be retired by now, which is something I’m still working towards retiring early. But I think that understanding the power of compound interest and time when it comes to building wealth that would be what I would like to know growing up and that’s it. Thank you Jen for inviting me to share my answer, take care. Bye. [00:04:49.3] C: “My name is Christina and I am a freelancer in the media industry in Toronto. The best money advice I wish I had or listened to growing up is to save towards retirement. This would have made a difference because of compound interest. The earlier you start, the less you have to save as you get older and once you have a mortgage, kids and other hefty expenses, you’ll be happy or wishing you started early. [00:05:18.3] JH: Yes, the magic of compound interest is so invaluable to know about because that’s where just the essence of time makes such a huge difference. For example, let’s say just for example say that Sue started saving at 25 years of age. She saved for exactly 10 years and after that she stopped saving and she just let it sit until she was 65. Okay? Now let’s say Lisa started saving at 35 years of age for 10 years just like Sue. So Sue and Lisa saved the exact amount monthly. So I don’t know, I’m just going to say $100 a month, right? The only difference is Lisa started saving at 35 years of age and Sue started saving at 25 years of age. So they saved the same amount, they started at different ages and they saved for the same duration of time, that’s 10 years. So they both stopped at 10 years and then they let that money sit and just accumulate the interest until they were 65 years of age. Okay? So who’s going to have more? Sue. Just because of that magic of time. That is a value of compound interest, okay? [00:06:52.3] JH: And I have seen a picture. She shared that in our community, she is beautiful. [00:07:16.3] JH: I agree Breena, but sometimes we don’t know what we don’t know but fortunately, now with the internet it is so easy and so convenient to do that comparison shopping without even leaving your house. So thanks for sharing that. Now let’s hear what Melinie had to say about the best money advice she wish she knew growing up. [00:07:39.3] M: Hi, my name is Melinie and I am a wife and theater artist in New York City and the one piece of advice I wish I got growing up was how exactly to save money. I was told over and over again, “You need to save money, you need to save money,” and I was never actually explained the nuts and bolts of how that would look and I think that would have made a difference because I wouldn’t have gone into my spending career, budgeting career unclear. I was just so unclear about what saving and budgeting in a financial future can look like because I just didn’t know how to implement what I didn’t know and it just always seemed like a very big thing that other people knew how to do very well. Either they knew how to do it very well or they didn’t know how to do it at all. So that would have been so instrumental and I’m learning it now. So it’s taking some shifting in the way I think about money but its overall just a relief and it’s not this overwhelming burdensome idea. [00:08:55.2] JH: I love what Melinie had to say. Saving can be easy. Everybody says to save and they make it seem like it’s easy, but if you don’t know where to save from or you don’t understand your flow of money, it can be difficult. So understanding the how is definitely important and relevant and a part of helping you do this is having a clarity on your money. So all that money that’s coming in and all that money that is going out. And having that clarity will allow you to see what exactly you have to save so you can put it aside. So thanks for sharing that Melinie. [00:09:39.3] D: “Hi, I’m Darla. An auntie to two nephews and an interior designer living in Moose Jaw, Saskatchewan, Canada. The best money advice I wish I’d had growing up is learning at an early age how to develop a budget to live within my means and that money is a lifelong friendship. [00:10:29.9] JH: Love that Darla, thanks for sharing that. I really love Darla’s point on money being a lifelong relationship. It’s so very true. Life changes all the time whether it be something happening to you like a job change, a promotion, maybe unemployment. It’s life, right? Or maybe it’s a change on your side where you have a change of heart on how you want to live your life. Maybe you want to upgrade your living, maybe you want to downsize. Maybe you want to be working only certain months of the year and vacationing the rest, I don’t know, whatever that is for you, and with that, that changes how you spend your money as well. So that happens throughout time and that’s why it’s definitely a lifelong relationship. So I love that she brings up that point. So those are the ladies that wanted to share their thoughts. I hope that you found that valuable and interesting because I know I sure did and since I asked you to play, I should probably share my thoughts too, right? So for me, the best money advice I wish I had growing up was how much the way that you were brought up affected how you dealt with money. I’ve always been a good money manager but for a long time what held me back was understanding the stories that were going in my mind about money and what I was saying about money. So in the most popular one being “we can’t afford that”. I said that for a good while because that’s what I heard growing up and I didn’t know better and once I realized this piece, things shifted for me and all in a good way. Because I know I’ve said in past episodes, “What you put in your brain is what you’re going to get out,” right? Your brain, what you listen to, what you tell yourself, the brain has a way of just bringing those things to life. So if you think negatively about money, you will just see negative things about money, right? But if you open up your mind and think differently about money, your brain is going to allow you to think and show you a different way. So that was for me the most impactful for me and I wish I knew that earlier on. So that is a wrap for today. I want to do a special thank you to Shannon, to Rachel, Mabel or Maybel as some people would say, Christina, Breena, Melinie and Darla for sharing your thoughts. I really, really appreciate that as I know it will help someone listening. Now next week on the podcast, actually there’s going to be a special guest that we’re going to be talking about student loans and that interview is actually a two part series because there’s so much good stuff in the interview. So I broke it up into two parts. There’s just so much stuff. I thought one episode would be too much, so I have broken that up into two episodes so I know it’s a great two episode. So definitely, if you have student loans, if you have kids and you are looking into either student loans or avoiding them, whatever the case maybe, it’s a great episode to listen to. 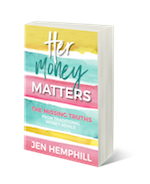 Also, don’t forget to download your mini guide at jenhemphill.com/miniguide especially if you are feeling lost as to what in the world is going on with your money. It is definitely a great place to start. So thanks again for taking time out of your busy schedule to tune in to the show. 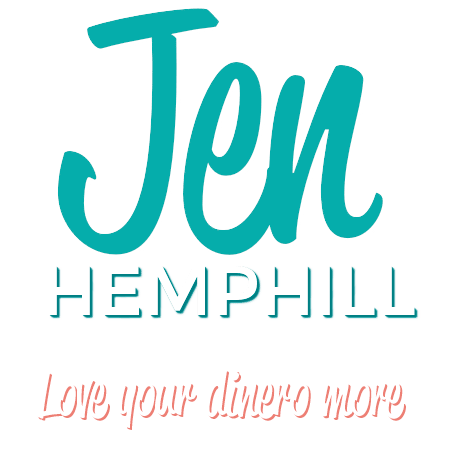 You can check out the show notes and the transcript over at jenhemphill.com/67 and I will see you again next Thursday.